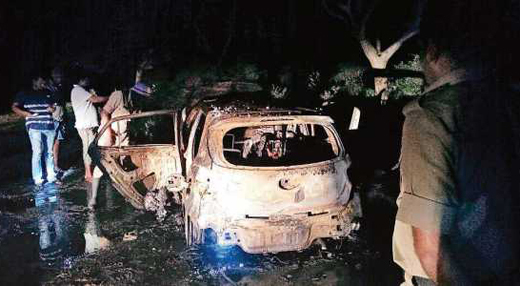 Udupi, June 10, 2018: The bodies of a man and woman were found charred inside a car near Pushpagiri Hills of Halebeedu in Hassan around 11 pm on Friday. The bodies are charred beyond recognition. The deseased are identified as Girish (35) a bakery owner in Karkala and Sandya (28), who worked at a goldsmith shop in Karkala. A police officer said that the investigation was under progress and he could not reveal the details. He also did not confirm whether it was a suicide or murder, but sources in the police department suspected it to be a murder. The same sources said that the two deceased – Girish , a resident of Samudravalli near Arehally of Belur taluk, and Sandya – were allegedly involved in an affair. Girish was married, but was not in good terms with his wife. He ran a bakery in Karkala, where he came in contact with Sandya, who worked at a goldsmith shop. The affair did not remain a secret and Sandhya’s family warned Girish to stay away, the sources said. It is suspected that Girish and Sandhya might have come to Pushpagiri Hills to marry, but there is no confirmation of their marriage. Sources said that the either Girish or Sandhya’s family might have been involved in the murder over their illicit affair. They might have followed the two all the way and might have hired someone to set the car ablaze. Halebeedu police have registered a case and are investigating. Have got for what they have done.